Format: Mostly comic strips, with some text stories and features. Comments: Wham! was the first of what would become known as The Power Pack comics, alongside sister titles Pow!, Smash!, Terrific and Fantastic. 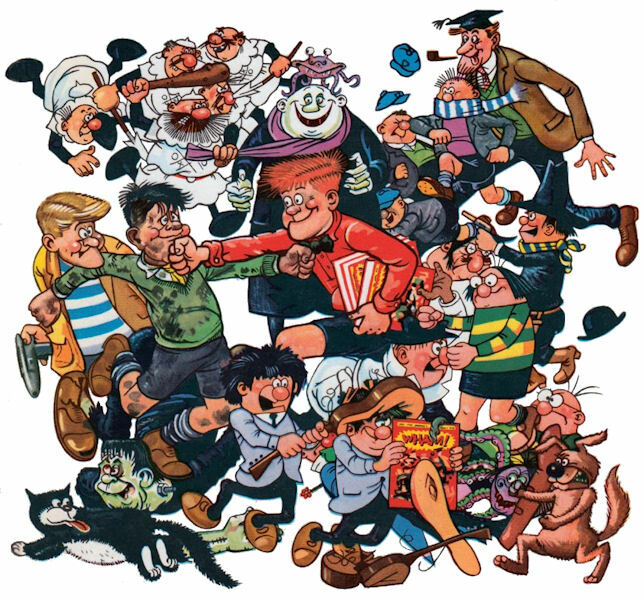 Artist and writer Leo Baxendale had been one of the mainstays of DC Thomson's Beano and Beezer since first starting work for the company in the early 1950s, and had created several of the Beano's most popular strips, but had come to feel increasingly overworked and underappreciated, until finally an argument with his editor over redrawing a strip saw him quit the Beano and start looking elsewhere for work. With interest from several fronts, Odhams Press managing editor Alfred Wallace strived to ensure he was the one to get Baxendale. Not only did he offer to double Baxendale's DC Thomson page rate for art, but he also added payment on top for scripts (something Baxendale had not had previously), and, to cap it off, rather than slotting Baxendale into an existing title, Wallace offered to create a new title built around Baxendale's creations. 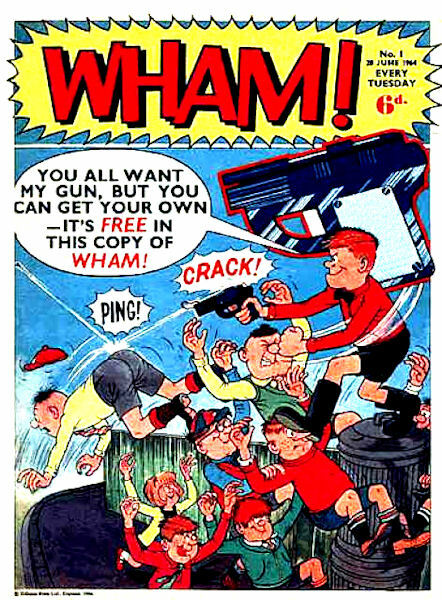 Conceived by Baxendale as a Super-Beano, the result was Wham!, the first of what became the Power Comics. The vast majority of the title's early strips were created, drawn and frequently written by Baxendale - in the first issue General Nitt and his Barmy Army, The Wacks, The Tiddlers ("The Kids from Canal Street Road", not dissimilar to Baxendale's Beano creation The Bash Street Kids), Eagle-Eye Junior Spy, Danny Dare ("Dan Dare's Number One Fan"), Biff, The Humbugs, Pest of the West, George's Germs and Footsie the Clown were all his, while only Kelpie the Boy Wizard and Billy Binns and his Wonderful Specs were not. As time went on, however, Baxendale had to hand over art chores for some strips to others, such as Gordon Hogg and Brian Lewis. Of all the Power Comics, Wham! was the most dominated by humour strips, with only a handful of adventure strips during its run - the aforementioned Kelpie and Billy Binns, plus later additions such as Western strip Johnny Straight (a reprint of Zip's Wells Fargo), sailor Tornado Jones, and, from #112 (6th August 1966), reprints of Marvel Comics' early Fantastic Four. It lasted 187 issues, the final one cover dated 13th January 1968, before being merged with its younger sibling, Pow!. Despite this, Wham! continued to have its own annuals - seven Wham! Annuals were released between 1965 and 1971 (cover dated 1966 to 1972, due to the way British annuals are dated), and one Wham! and Pow! Annual was published, in 1972 (but numbered as an 1973 Annual).